Cambridge Model 660 “Classic” Series platform scales feature top leveling access and top access to the plastic NEMA 4x junction box for convenient leveling and corner adjustments. Sizes range from 24” x 24” 1,000 lb capacity to 120” x 144” with 20,000 lb capacity. Cambridge Scale Works, Inc. has been building high quality scales for more than two decades in Western Chester County, Pennsylvania and high quality scales and electronics for nearly a decade in Western Maryland. These expansions were necessary to accommodate the growing product line including the Classic 660 heavy duty floor scale. The Classic 660 is available in a wide range of standard sizes and capacities. There are also large floor scales available in this model as well. Cambridge Scale Works reputation for "over-building" stems from their experience in the service end of the scale business. That experience gave the manufacturer a unique insight into what can cause scales to fail. Cambridge has taken that experience and applied design and manufacturing measures to combat those flaws. They have also considered routine calibration and maintenance of their scales during the engineering process, yielding convenient service access into each of their scales. That is why Cambridge is confident in describing their scales as the toughest, best built scales and electronics in the industry. 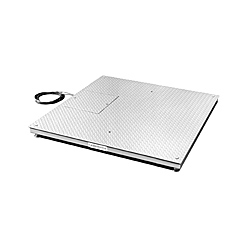 Call us today (919) 776-7737 to get one of these heavy duty floor scales quoted today. • Shielded signal and load cell cables protected inside tubular steel frame. 24” X 24” X 3.5” 1,000 Lb. 88 Lb. 3/16"
2,500 Lb. 88 Lb. 3/16"
30” X 30” X 3.5” 1,000 Lb. 115 Lb. 3/16"
2,500 Lb. 115 Lb. 3/16"
36” X 36” X 3.5” 1,000 Lb. 165 Lb. 3/16"
2,500 Lb. 165 Lb. 3/16"
5,000 Lb. 215 Lb. 1/4"
48” X 48” X 3.5” 1,000 Lb. 345 Lb. 3/16"
2,500 Lb. 345 Lb. 3/16"
5,000 Lb. 345 Lb. 1/4"
10,000 Lb. 380 Lb. 1/4"
48” X 48” X 5” 20,000 Lb. 440 Lb. 5/16"
48” X 60” X 3.5” 5,000 Lb. 405 Lb. 1/4"
10,000 Lb. 465 Lb. 1/4"
48” X 60” X 5” 20,000 Lb. 580 Lb. 5/16"
48” X 72” X 3.5” 5,000 Lb. 495 Lb. 1/4"
10,000 Lb. 560 Lb. 1/4"
48” X 72” X 5” 20,000 Lb. 725 Lb. 5/16"
60” X 60” X 3.5” 5,000 Lb. 515 Lb. 1/4"
10,000 Lb. 595 Lb. 1/4"
60” X 60” X 5” 20,000 Lb. 755 Lb. 5/16"
60” X 84” X 5” 10,000 Lb. 1,145 Lb. 1/4"
20,000 Lb. 1,380 Lb. 5/16"
72” X 72” X 5” 10,000 Lb. 1,180 Lb. 1/4"
20,000 Lb. 1,420 Lb. 5/16"
72” X 96” X 5” 10,000 Lb. 1,570 Lb. 1/4"
72” X 96” X 5.5” 20,000 Lb. 1,890 Lb. 5/16"
72” X 120” X 5.5” 10,000 Lb. 1,855 Lb. 1/4"
20,000 Lb. 2,100 Lb. 5/16"
96” X 96” X 5.5” 10,000 Lb. 2,010 Lb. 1/4"
20,000 Lb. 2,420 Lb. 5/16"
96” X 120” X 5.5” 10,000 Lb. 2,590 Lb. 1/4"
20,000 Lb. 3,120 Lb. 5/16"
120” X 120” X 5.5” 20,000 Lb. 3,830 Lb. 5/16"
120” X 144” X 5.5” 20,000 Lb. 4,675 Lb. 5/16"